JL F.I.T. DVD description – Kettlebell & Movement Instructional DVD illustrates a complete body workout. Kettlebell & Movement instructional DVD is supplemented by a detailed Manual describing each exercise. It includes 3 complete workouts and a number of complex exercises to assist you in keeping your workout challenging. JL F.I.T. 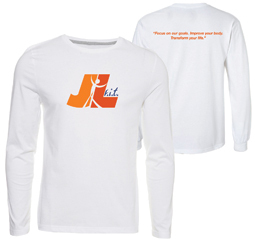 T-Shirt is a Gilden Ultra Cotton White Long-Sleeve.